When I can’t sleep, sometimes I cook. I have restless legs quite a bit these days, so sleep has come late if at all. Nights like this it’s not at all. Because I got a little hungry, I cooked up some of this new bacon I have. Normally I buy pre-packaged bacon, but with all this reading I’m doing on paleo and gluten-free stuff, the bacon from the butcher shop at Kroger caught my eye. The butcher shop buys these big honking slabs of bacon that are smoke-cured with little sodium (relatively speaking; it is bacon, after all) and very little sugar. Then they cut them into slices right there in the store. The price for a pound and a half is the same as the price for the Wright’s Applewood Smoked bacon we normally buy, so I said, ‘Why not?” And they are big, honking slices with big grinds of pepper on them. They are YUM! Anyway, long story short, when I was getting the bacon out I noticed I still have some leftover herbed Chèvre from when I made the cauliflower pizza crust and made a mental note to use it soon. 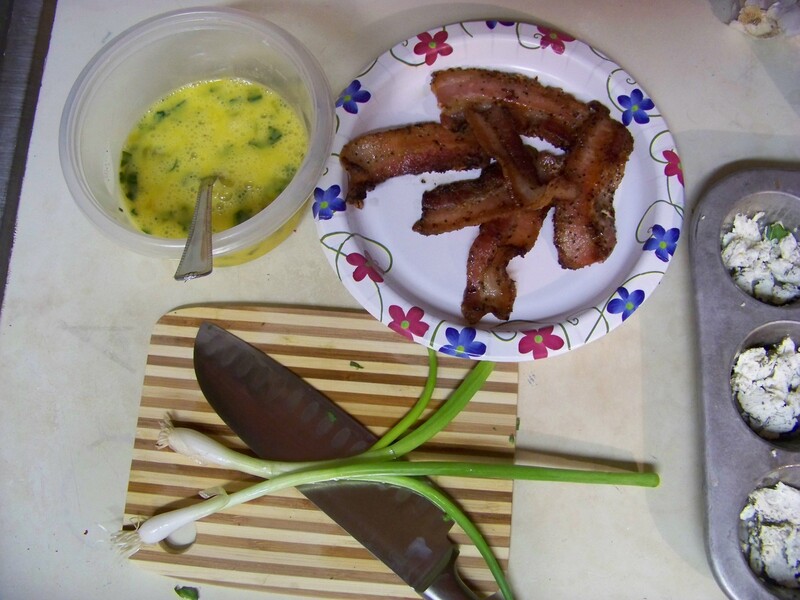 Then I got a lightening bolt to the brain and thought to myself: “Awesome bacon plus awesome Chèvre….hmmm, marriage made in heaven!” I had also bought farm fresh eggs just a few days before, so this was shaping up to be a fabulous morning, insomnia be damned. So I took to Google and put the cheese and bacon along with egg in the search engine and presto! Out came this recipe. The Google is so magic. One problem though: I don’t have ramekins. Bummer. And I’d never made coddled eggs before, so double-bummer. I put ramekins on my garage sale wishlist and proceeded to Plan B: Mostly the same ingredients, but with breakfast muffins. I skipped the cream because who needs that kind of additional fat, and my muffin tin is way old thus the muffin hole are muy pequeña. First I preheated the oven to 350 and put the bacon on to fry. Not too crispy, mind you, as this will go in the oven to cook for a bit longer. 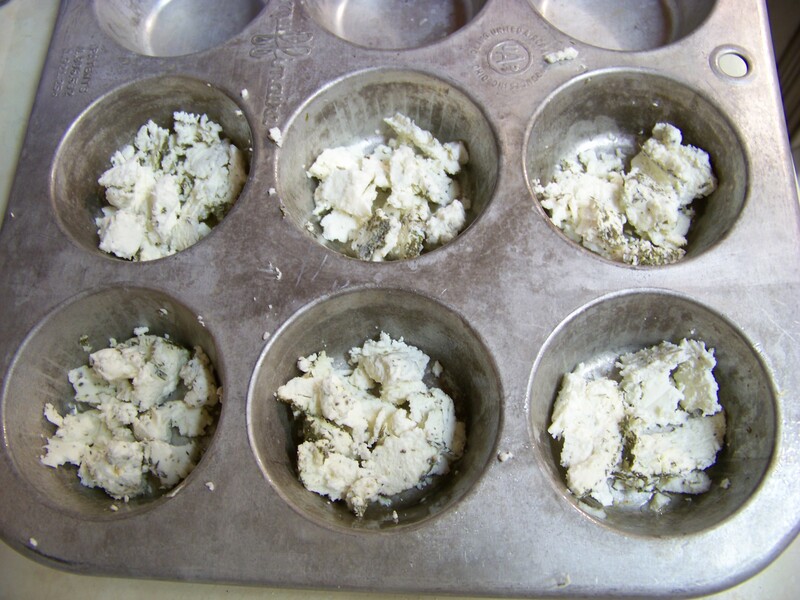 Then I slathered a little butter in my husband’s grandma’s old muffin tin and put the Chèvre down. I scrambled the eggs in a bowl and added the salt and pepper. Diced up the basil and added that, too. When the bacon was done, I diced it as well. 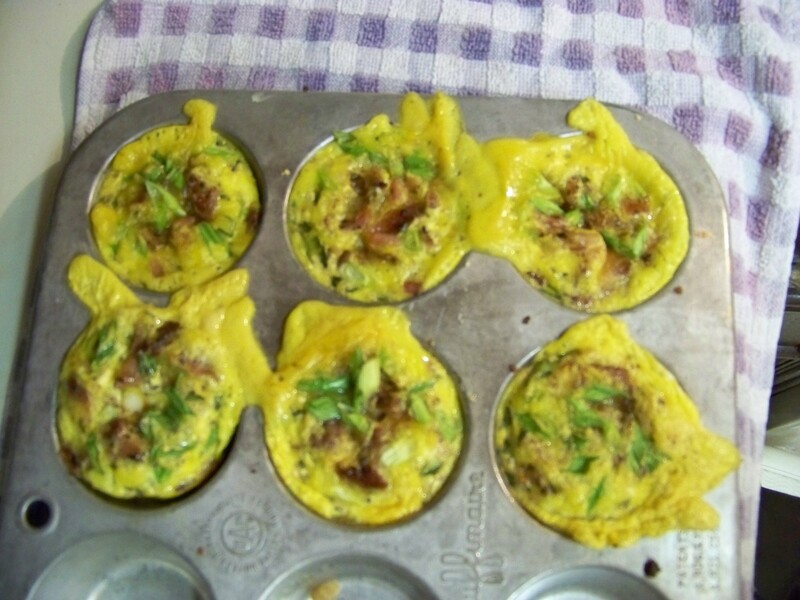 Then I poured just enough egg to almost come to the top of each muffin hole, and then sprinkled bacon in each egg muffin. Garnished with the scallions. Slipped ’em in the oven for 15 minutes, and then let them set for 5 minutes on the counter to finish off the slightest bit of runny egg in the middle of the largest two. OMG, these are soooooo good. 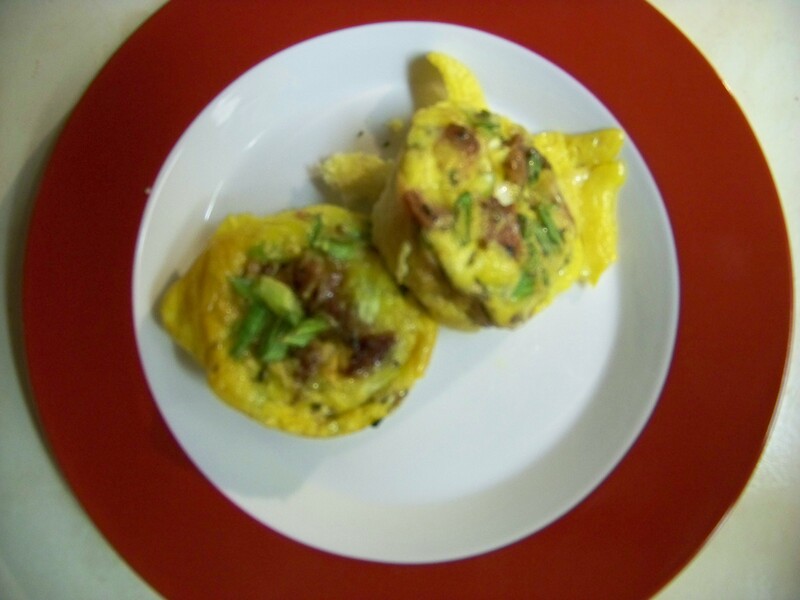 The Chèvre and bacon combine with the egg to make the smoothest little spark of flavor. Then the basil really makes it pop. I only added the basil because I had just one sprig left and it was about to go, and I’m so glad I did! Now I need to go log this recipe at My Fitness Pal so I can see how much caloric damage it does, and because I’ve had two, and I want another one! I’ll post the stats in comments.